Located just 12 miles from downtown Charleston, South Carolina, Wild Dunes Resort offers 1,600 acres of world-class golf, top-ranked tennis, award-winning restaurants, and miles of pristine beach. The choice of lodgings includes condos, luxury homes, the Boardwalk Inn, and The Village, the last two just steps away from the 10,000-square-foot Sweetgrass Pavilion, a state-of-the-art conference center. Together with the Grand Pavilion—a seaside venue ideal for alfresco cocktail receptions, mixers, and buffet-style dining affairs—Sweetgrass covers all the bases with its flexible ballrooms for up to 300 delegates. The latest technology, professional event coordination, and destination management services ensure a getaway no one will ever forget—especially when you factor in spa services, a fitness center, organized recreational programs, team-building, beachside competitions, and tournaments on the two 18-hole Tom Fazio–designed golf courses. CHARLESTON, S.C., May 3, 2016 – Wild Dunes Resort, A Destination Hotel has announced the opening of Coastal Provisions, its new nautical restaurant nestled into the heart of The Boardwalk Inn. Led by Executive Chef Brett Sparman, this upscale seafood and chop house style eatery features crave-worthy cuisine sourced from local and regional purveyors for breakfast, lunch, happy hour and dinner. Guests can choose to dine inside or al fresco on the poolside terrace, home to breathtaking ocean views. Thoughtfully crafted menus reflect both casual and refined coastal offerings, appealing to a wide range of diners’ preferences. Guests seeking a gourmet dinner can choose from signature seafood and meat dishes like Seared Scallops with creamed corn and sherry gastrique, Gulf Shrimp & Grits with tasso-andouille gravy and Bone-In Pork Chop with Niman ranch. Diners seeking a casual lunch in the lounge or poolside can also choose from satisfying options like the Lowcountry Cubano with mustard aioli, Fried Oyster Po’boy with housemade pickles and the Seafood Wedge Salad with local crab, shrimp and buttermilk dressing. Those seeking a sweet or savory start to their day can also choose from breakfast options like the Duck Hash, Shrimp & Crab Omelet and Bread Pudding French Toast with homemade apple butter and white chocolate drizzle. A haven for creative craft cocktails, Coastal Provisions is also a great spot to unwind for happy hour with drinks like the Coastal Hooch made with strawberry moonshine and muddled blackberries or the Smoke & Spice with mezcal tequila, serrano chile, agave, fresh lime and smoked salt. Coastal Provisions is open from 6:30 a.m. - 11 p.m. Monday through Sunday. To make a reservation, please visit www.wilddunes.com/charleston-boardwalk-dining or call 843.886.2200. Nestled on the northern tip of Isle of Palms, a lush barrier island off the coast of South Carolina, Wild Dunes Resort, A Destination Hotel, is located 30 minutes from the charm and grace of historic Charleston. The Resort occupies 1,600 acres of oceanfront paradise with a variety of accommodations ranging from the AAA Four-Diamond Rated Boardwalk Inn and The Village at Wild Dunes to private condos and luxury home vacation rentals. Offering a year-round menu of championship golf, nationally-ranked tennis, award-winning recreation, spa services and restaurant options, Wild Dunes Resort has been distinguished by many publications and associations as a top destination for families, golfers, tennis lovers, and meeting and event planners. Visit Wild Dunes Resort online on Facebook, Twitter and Youtube. CHARLESTON, S.C., August 12, 2015 – Wild Dunes Resort, A Destination Hotel, is currently undergoing significant renovations to its famed Links Course, Tom-Fazio’s first-ever solo design, with plans to reopen late October, 2015. The updated course will be as visually stunning as it is playable, featuring a new irrigation system, Champion Bermuda grass greens, concrete cart paths, renovated halfway house, enhanced practice facility with a 4,500 square-foot putting green, new coastal marsh views and holes 16-18 opening up to the Atlantic Ocean. In addition, the Links Clubhouse is undergoing key improvements including extensive interior renovations with two newly furnished outdoor decks- the Fazio Dining Deck with fireplace and the Golfer’s Deck off of The Sand Bar, a full-service diner-style restaurant open for breakfast, lunch and post-round drinks. Wild Dunes Resort is giving players a chance to win free golf on the new Links Course or Harbor Course with its #WildGolfGram social media contest. Players are encouraged to capture a photo of their Wild Dunes Resort golf experience and share via Facebook, Instagram or Twitter with the tags #WildGolfGram, #LinksCountown and @WildDunesResort. Entries are welcomed through Sept. 30, 2015, with prizes announced monthly. For more contest details, please visit www.wilddunes.com/linkscountdown. Charleston’s homes, churches, gardens and gates are adorned in elaborate and iconic ironwork dating back to the city’s origination. Guests learn this celebrated Lowcountry art form and create a commemorative piece. For all updates on Wild Dunes Resort’s newly renovated Links Course, please visit www.wilddunes.com/linkscountdown. Check back shortly for more information on the Links Course Launch Weekend, scheduled for Nov. 13-15, 2015. During the closure, the Harbor Course will be open for play based on availability. For rates and tee times, please visit www.wilddunes.com/teetimes or call 843-886-2164. Nestled on the northern tip of Isle of Palms, a lush barrier island off the coast of South Carolina, Wild Dunes Resort, A Destination Hotel, is located 30 minutes from the charm and grace of historic downtown Charleston. The Resort occupies 1,600 acres of oceanfront paradise with a variety of accommodations ranging from the AAA Four-Diamond Rated Boardwalk Inn and The Village at Wild Dunes to private condos and luxury home vacation rentals. Offering a year-round menu of championship golf, nationally-ranked tennis, award-winning recreation, spa services and restaurant options, Wild Dunes Resort has been distinguished by many publications and associations as a top destination for families, golfers, tennis lovers, and meeting and event planners. Visit Wild Dunes Resort online on Facebook, Twitter and YouTube. Destination Hotels (Destination) is a collection of luxury and upscale independent hotels, resorts and residences across the United States. Offering authentically-immersed and enriching experiences, each property is individual at heart, yet connected by a commitment to drawing upon the best of each location. Highly distinct, the Destination experience is always memorable and matchless; guests will feel the locale in a genuine way through each property and during the engaging moments cultivated both in and outside of them. Continuously growing with more than 40 properties from coast to coast, the award-winning portfolio features 20 renowned golf courses, 19 indigenous spas, and 110 exceptional bars and restaurants. Destination Hotels are true to our place; diverse by design. For more information, visit www.destinationhotels.com. Follow us on Twitter: @Destination. Like us on Facebook: DestinationHotels. This year’s contest garnered more than 1,200 entries from around the world, with entries judged by top executives throughout the industry. “This is an outstanding achievement for our entire team,” states Ivie Parker, director of marketing for Wild Dunes Resort. “This honor resulted from a collective effort fostered through dedicated partnerships, hard work, creativity and enthusiasm to increase the quality and scope of our program. We want to sincerely thank everyone involved." HSMAI will pay tribute to Wild Dunes Resort during the annual HSMAI Adrian Awards Gala, a black-tie affair attended by more than 1,000 hospitality, travel and tourism marketing executives at the New York Marriott Marquis on Feb. 23, 2015. In addition to commending Wild Dunes Resort’s award-winning work, the Gala and dinner reception honors lifetime achievement in travel/hospitality marketing, as well as The HSMAI Top 25: Extraordinary Minds in Hospitality Sales, Marketing and Revenue Optimization. All winning entries will be accessible in the Adrian Awards Winners Gallery online following the gala at www.adrianawards.com . Visit www.AdrianAwards.com for more information on the event and competition. The Hospitality Sales and Marketing Association International (HSMAI) is committed to growing business for hotels and their partners, and is the industry’s leading advocate for intelligent, sustainable hotel revenue growth. The association provides hotel professionals & their partners with tools, insights, and expertise to fuel sales, inspire marketing, and optimize revenue through programs such as HSMAI’s MEET , Adrian Awards , and Revenue Optimization Conference . HSMAI is an individual membership organization comprising more than 7,000 members worldwide, with 40 chapters in the Americas Region. Connect with HSMAI at www.hsmai.org, www.facebook.com/hsmai , www.twitter.com/hsmai and www.youtube.com/hsmai1 . Nestled on the northern tip of Isle of Palms, a lush barrier island off the coast of South Carolina, Wild Dunes Resort , A Destination Hotel , is located less than 30 minutes from the charm and grace of historic Charleston. The Resort occupies 1,600 acres of oceanfront paradise with a variety of accommodations ranging from the AAA Four-Diamond Rated Boardwalk Inn and The Village at Wild Dunes to private condos and luxury home vacation rentals. Offering a year-round menu of championship golf, nationally-ranked tennis, award-winning recreation, spa services and restaurant options, Wild Dunes Resort has been distinguished by many publications and associations as a top destination for families, golfers, tennis lovers, and meeting and event planners. Visit Wild Dunes Resort online on Facebook , Twitter and Youtube . Led by award-winning professional photographer Tiffany Briley , Wild Dunes Resort is offering three distinct photography tours for beginners and experts alike that range from discovering historic downtown Charleston to capturing the breathtaking backdrop of the Resort’s from seascapes to marshlands to century old oaks and more. Participants are educated, equipped and inspired to shoot the essence of the Lowcountry and learn the art of image storytelling. Discover Charleston Package: Designed for a variety of levels, the photographic guide escorts the group to capture the charm and grace of Charleston from cobblestone streets to waterfront parks to secret gardens adorned with ornate ironwork. This tour is four hours long and runs daily. Budding Photographer Tour #NoFilterNeeded: Pre-teens and teens are led on a photographic adventure throughout the resort to document their favorite vacation moments from wildlife encounters, to moments with friends and family; to picturesque landscapes using a traditional camera or smartphone. In the age of social media, teens can share their photographic art in real time with friends back home-tag it! This tour is offered Tuesdays and Thursdays from 9-11 a.m. The Dunes Package: This package is perfect for guests wishing to stay on property and seize the serene beauty of Wild Dunes Resort’s seascapes, marshland, trails and more. Participants learn the basic functions of a camera, the art of composition and how to capture an invaluable moment with a photograph. This tour lasts 2-3 hours; times vary. Charleston & Beyond Package: This ultimate photography tour spans two days and hosts participants in Charleston and its nearby sites. Photographers of all levels will expand their knowledge and passion for this art while shooting both well known and “secret” local spots. The tour is two days long (20 hours) and is offered daily. Additionally, each tour can be upgraded to include a signature commemorative photo that is professionally printed with exceptional detail and beautiful luminescence. Accommodations start at $135 from now through February, $229 from March through May and $289 from May through Labor Day. For more information or to book accommodations, please call 888-778-1876 or visit www.wilddunes.com . carriage tours, shopping on King St., the Historic Charleston Market, plantation experiences and a year-round calendar of festivals and events. CHARLESTON, S.C., May 05, 2014 – Now through fall 2015, meetings and groups visiting Wild Dunes Resort, by Destination Hotels & Resorts, can share an unforgettable Southern meal with the Lee Brothers, masters behind Charleston’s thriving culinary scene. James Beard award-winning cookbook authors and regular contributors to Travel + Leisure and Bon Appétit, Matt and Ted Lee are beloved icons in the celebrity chef world. With multiple TV appearances on Food Network, Travel Channel, NBC’s “The Today Show” and CBS’ “Early Morning Show” as highlighted in this video, the Lee Brothers’ lively personalities and flair for the flavors of Charleston make them a favorite among such stars as Bobby Flay and Mario Batali. With choice from a conversational cooking class, traditional Lowcountry oyster roast or custom dinner featuring recipes from any of the Lee Brothers’ award-winning cookbooks, groups can sip, savor and shuck their way through authentic Charleston cuisine with the iconic duo themselves. Matt and Ted Lee will introduce guests to the distinctive concepts and ingredients unique to the city with cuisine options like Hoppin’ John, Oyster Pie and the acclaimed Southern specialty Shrimp and Grits. 1. The Lowcountry’s Greatest Hits: An introduction to the classic treats of the region, with stories and personalities featuring Artichoke Relish, Shrimp and Grits, Hoppin’ John, Oyster Pie, Banana Pudding and Mint Juleps. 2. Simple Fresh Southern: A look into contemporary cooking and Southern food as a living art featuring Honeydew Wine Coolers, Pimento Cheese Potato Gratin, Smoked Shrimp with Buttermilk Dip, Butterbean and Mint Spread, and Cornmeal Drop Biscuit Peach Cobbler. 3. The Charleston Kitchen: This demo highlights the Lee Brothers’ hometown, weaving in the characters that make Charleston a unique place to cook and live, featuring St. Cecilia Punch, Oyster Pie, Crab Gratin, Chicken Purloo, Benne Wafers, Roast Duck and Huguenot Torte. 4. Barrier Island Cuisine: Groups explore the rare bounty of island food that Matt and Ted grew up foraging, featuring Cactus Pear Margaritas, Conch Fritters, Roast Venison with Mulberry, Whiting in Parchment with Smilax and Sea Beans, Roast Duck and Jasmine Custard. Groups can discover the most quintessential of outdoor Lowcountry traditions as the Lee Brothers host and preside over a traditional oyster roast. Guests will sip Brandied Plum Cocktails and local beers as Matt and Ted walk them through three stations including an oyster-roasting griddle stoked by a wood fire, the crab crack table and the Frogmore stew table. *The Oyster Roast Experience can serve as a dinner itself or can be an appetizer/cocktail hour to a seated Lee Brothers Custom Dinner (see below). Groups seeking to create their own custom dining experience can collaborate with the Lee Brothers and craft a menu complete with dishes from any of their award-winning cookbooks or recipes of their own choosing. Matt and Ted will mingle with guests throughout the cocktail hour and make remarks at the beginning of the meal as well as throughout the dinner if guests so wish, describing the backgrounds and flavors behind the recipes. Driving distance to downtown Charleston, Wild Dunes Resort offers the “best of both worlds” for a corporate outing or group vacation, pairing an island setting with the tremendous offerings of historic Charleston minutes away. With the recent introduction of JetBlue flights from the Northeast, as well as service on Southwest, American, Delta, US Airways and United, Charleston is now more accessible for meetings and groups than ever before. Wild Dunes Resort offers a variety of meeting venues from traditional boardrooms to beachfront spaces including the The Sweetgrass Pavilion, Palmetto Hall, an Executive Boardroom and Club Room at the Boardwalk Inn and the Grand Pavilion. While on property, meetings and groups can also enjoy the resort’s abundance of amenities including 36 holes of championship golf, 17 tennis courts, watersports, spa services, resort-wide pools and delicious dining options. After enjoying an unforgettable Lee Brothers culinary experience, groups can take advantage of the Resort’s amenity rich offerings steps away from their meeting rooms and accommodations or head off property to explore one of the many offerings of downtown Charleston including shopping on King Street, the Historic Charleston market, group carriage rides, walking tours, plantation tours and much more. To book a Lee Brothers Charleston culinary experience, Wild Dunes Resort suggests at least a two week lead time and culinary experiences are based on availability. For more information on any of the Lee Brothers culinary experiences or for more meetings specials and packages, please call 866-499-7142 or visit www.wilddunesmeetings.com. Siblings Matt and Ted grew up in Charleston, South Carolina. When they left to attend colleges in the Northeast, they so missed the foods of their hometown that they founded The Lee Bros. Boiled Peanuts Catalogue, a mail-order catalogue for southern pantry staples like stone-ground grits, fig preserves, and, of course, boiled peanuts. When an editor of a travel magazine asked them to write a story about road-tripping their home state in search of great food, they embarked on a second career as food and travel journalists. Since 2001 they have been contributing editors at Travel + Leisure and they frequently write food stories for Bon Appetit, The New York Times, GQ and Food & Wine, among other publications. Their three cookbooks, The Lee Bros, Southern Cookbook, The Lee Bros. Simple Fresh Southern and the new Lee Bros. Charleston Kitchen have won a combined six James Beard Foundation and IACP Awards. For more information on the Lee Brothers, visit www.mattleeandtedlee.com. 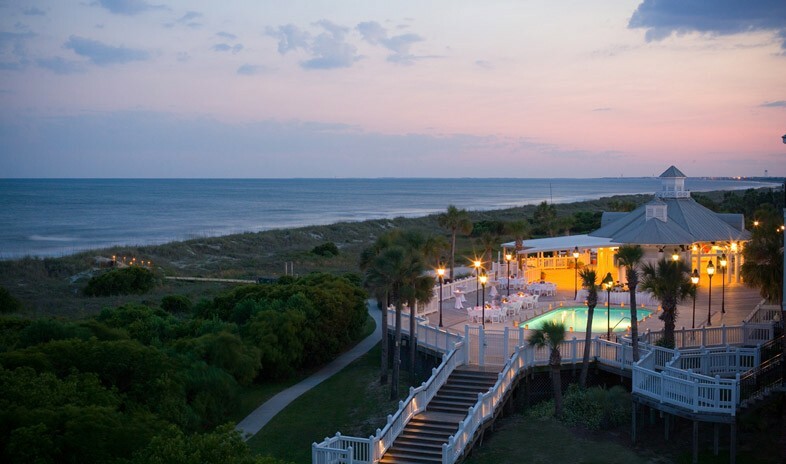 Nestled on the northern tip of Isle of Palms, a lush barrier island off the coast of South Carolina, Wild Dunes Resort, by Destination Hotels & Resorts, is located less than 30 minutes from the charm and grace of historic Charleston. The Resort occupies 1,600 acres of oceanfront paradise with a variety of accommodations ranging from the AAA Four-Diamond Rated Boardwalk Inn and The Village at Wild Dunes to private condos and luxury home vacation rentals. Offering a year-round menu of championship golf, nationally-ranked tennis, award-winning recreation, spa services and restaurant options, Wild Dunes Resort has been distinguished by many publications and associations as a top destination for families, golfers, tennis lovers, and meeting and event planners. It is one of more than 30 independent, upscale and luxury hotels, resorts and golf clubs in the United States managed by Destination Hotels & Resorts, the fourth largest independent hospitality management company in the country. Visit Wild Dunes Resort online on Facebook, Twitter and Youtube. Destination Hotels & Resorts is an authentic collection of luxury and upscale independent hotels and resorts across North America. Offering enriching, locally-inspired experiences from alpine adventures and stunning beachfronts to urban landmarks, each property reflects the natural surroundings and culture of its distinctive locale. With more than 40 properties in premier travel destinations, including Aspen, Chicago, Denver, Lake Tahoe, Los Angeles, Maui, Miami, New Orleans, Phoenix, San Antonio, San Diego, Santa Fe, Seattle, Vail and Washington D.C., the award-winning portfolio features renowned golf courses, indigenous spas, and exceptional culinary venues. For more information on Destination Hotels & Resorts, visit www.destinationhotels.com. Follow us on Twitter: @Destination. Like us on Facebook: DestinationHotels.